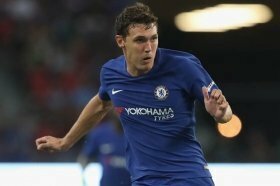 Denmark international Andreas Christensen has acknowledged that Chelsea are unlikely to sanction the sale of any first-team players this summer unless they can overcome their transfer embargo. The west London giants were levied with a two-window transfer ban by FIFA last month after breaking rules pertaining the handling of under-age players over a period of five years. The Blues have since appealed the decision in the hope of a positive outcome but should it not be the case, it appears that they will restrict any player sales in the summer. Speaking to Ekstra Bladet, Christensen has now revealed his frustration regarding the embargo and suggested that he could be forced to stay put, if things don't go in the club's favour. "The messages we've got are that Chelsea can't appeal the case and therefore want to keep all the players. The situation I have ended up in has been very difficult to accept," he said. The verdict of the appeal to FIFA is expected to be announced on April 11. Should the decision go against the Blues, they could take the case to the Court of Arbitration for Sport in order to at least freeze the ban temporarily.